The always calm waters of Tenakee Inlet allow you to enjoy fishing without the uncomfortable queasy feeling of rougher waters. 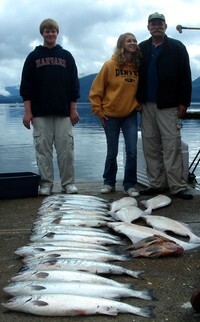 The inlet is forty miles long and is one of the more nutrient rich inlets in southeast Alaska. These waters attract baitfish which are followed by salmon and whales. There are about 750,000 salmon that migrate to spawn in the rivers of our inlet. 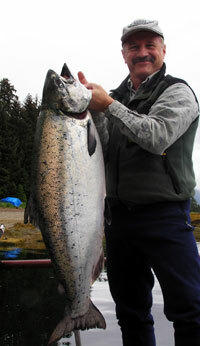 Coho, chum and pink salmon are abundant in the fourteen rivers flowing into Tenakee inlet and may be taken in fresh or salt water. 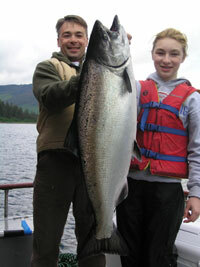 The largest species of salmon, the chinook, feed and may be landed in salt water areas near Tenakee Springs. 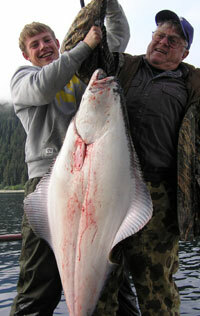 Halibut are common and can be caught during the entire summer season. Steelhead migrate into local streams during the early summer and our guide will be available to assist flyfishers in their quest.